A 2007 release in 1:18 scale from Yat Ming, this model is a bit light on detailing but more than acceptable for AMC fans with not a lot to choose from in this scale. Hood and doors open. Available now for $31.99 HERE . 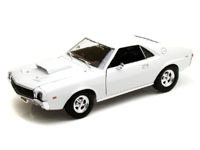 The 1968 and 1969 AMX has been done by both Ertl American Muscle and Autoworld. They both feature opening hoods and doors and have great detailing. Original colors included Red, Dark Green, Big Bad Blue, Big Bad Green and Big Bad Orange. They had red line tires and chrome wheels faithful to the original car, The new one from Autoworld is called the AMX Hurst SS (with super scoop on hood) and is available in Frost White and Red/White/Blue with lettering at $59.99 - $69.99 HERE . Older colors and versions in other scales can still be found on eBay. 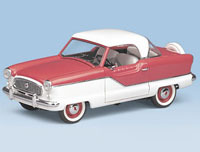 The cute little Nash Metropolitan, arguably the first American subcompact car was done in 1:18 scale by Highway 61. It was done in two versions, a convertible with removable roof and a hardtop. It came in several colors, usually with the color on top and white on the bottom with the hardtops having a white top. It was also available as a Taxi although there is serious doubt that it was ever dressed this way in real life. Was also done in different scales and styles by everybody from Franklin Mint to Johnny Lightning. Long since out of production, the 1:18 scale has become expensive and hard to find. It does show up sometimes on eBay .